Cards by Rita: FM45: Penguins! How fun is this new challenge from Lisa at The Friday Mashup? I think my pregnancy brain lost the spotlighting technique as I traveled from the living room to my stamp room, but I did remember the penguin! My husband and I are big penguin fans, so it made me happy to make this card. A local friend had asked me to make a card for her to give to a friend for their birthday and it just so happened that she wanted a penguin one! Perfect, right? Two birds, one stone thingy. I found this lovely card by one of my favorite stampers, Teneale Williams and used it as my inspiration starting point. Now while I'm not a fan of pink, I LOVE me some purple. I really love purple paired with green! The pretty paper from the Cheerful Treat hostess pack was just perfect for that combination. I didn't have any penguin stamps that were big enough, but the owl punch and a bit of surgery made a pretty passable penguin I think. A bit of bling, some yummy ribbon, and a button finish it off and add those extra touches that really make a handmade card special. I hope you'll join us this week at the Mashup with either a lovely penguin card of your own, perhaps a spotlighted card, or if you are an overachiever, a mashed up card featuring both! :) Also be sure to submit your idea for an upcoming Fan Favorite challenge! We'd love to see how you'd mash it up! 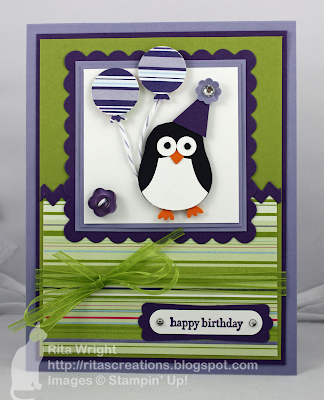 Sooooo adorable Rita, I love this card! I love the green and the ribbon looks fantastic! I love purple and green together too and this penguin is adorable. Oh my Rita, this is absolutely gorgeous. I'm with you on the whole purple and green together thing. Your use of the owl punch to create your penguin is nothing short of genius! I love how you made a penguin out of the owl punch! Very clever. Your color combo is fantastic, too; very bright and cheerful. Adorable! Looks like you are playing with a few more challenges. Hope you are feeling well!